What Really Is Internet Marketing And SEO? Many people get internet marketing and SEO very confused and often think they are the same thing. However, they are mistaking themselves. Internet marketing and SEO aren’t the same. SEO is a strategy within the broad internet marketing field. Some may believe they are the same thing because SEO is one of the main internet marketing strategies for websites and internet businesses. Although, SEO is just one of the many strategies listed under internet marketing, that doesn’t make them the same thing. What Are Internet Marketing Strategies? With the internet marketing industry being as broad as it is, there are dozens of strategies and tactics to be put in place. Things such as email marketing, social media campaigns, online branding, and videos, along with SEO, are all considered ethical strategies, depending on how they are implemented. Just like in the physical world of marketing, internet marketing is conducted in many different ways, and it just depends who the individual is that is putting the strategies into place. Many people have different views. Of course, the objectives of clients who are investing in an internet marketing campaign are also taken into consideration. SEO is one of the most popular ways to be successful with an internet marketing campaign, and should be considered if you operate an internet business and are serious about increasing your revenues. SEO consists of many strands, including content marketing strategies, as well as link building, which has many different strategies itself. Social sharing and gaining ranks are all things related to SEO, however, they do also fall under the broader internet marketing spectrum. This is the perfect example of how all aspects of online marketing tend to feed towards one objective, whether that is SEO, social marketing, content marketing, or something else. When someone is conducting SEO for their own website and business, they often use seo software tools to get the most out of their activities. All these tools act as an assistant, allowing the owner to see exactly how his strategies are performing and if there are areas to improve on. Google Webmaster Tools is probably the most well-known, as well as one of the most powerful, examples of an SEO tool, although it is also great for website maintenance in general. One of the most popular and trusted ways people gain good rankings and maintain a good SEO presence is through guest blogging and link building, which can be done using sites such as My Blog Guest. With how broad internet marketing is, you are given dozens of options to choose from to make your online business gain popularity and success. However, make sure you incorporate SEO into at least half of all your marketing strategies. SEO is the core to many websites’ success. Although, some of the many internet marketing strategies can be just as powerful it all depends on your business and how you implement strategies. 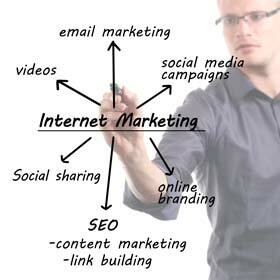 The most important part is to remember that each strand of internet marketing is not mutually exclusive. SEO will not be as powerful without a social element, but social media marketing won't work without useful content to attract people, which in turn drives SEO performance. Ralf's comment: It's true; the many things you can do in internet marketing can be daunting. Even for full time marketers it's not easy to balance the all the different tasks. 1. You've fallen in love with two or three strategies, and you're only doing those, ignoring anything else. If this is you, add a few more strategies to your arsenal. It's risky to build a business on repeating the same strategy over and over. Within SEO using only your favorite strategies will lead to an unnatural link profile. For example, if you use only blog commenting and guest blogging for back links, Google will soon realize, they are not 'natural' links. 2. You're jumping from strategy to strategy, never sticking long enough to see consistent results. If this is you, commit yourself to sticking with 1 strategy long term. Once you've mastered the first one, add another one.